You do not have to spend big bucks decorating your home. Furniture stores love it when you buy the couch, loveseat, chair and matching tables, or when you buy the bed, dresser, chest of drawers and matching bedside tables. The only problem is you end up with a room that looks more like a hotel than a home. It is better to be creative and mix it up a bit. I don’t have a window near my kitchen sink. I read that a mirror is a good substitute for a window. 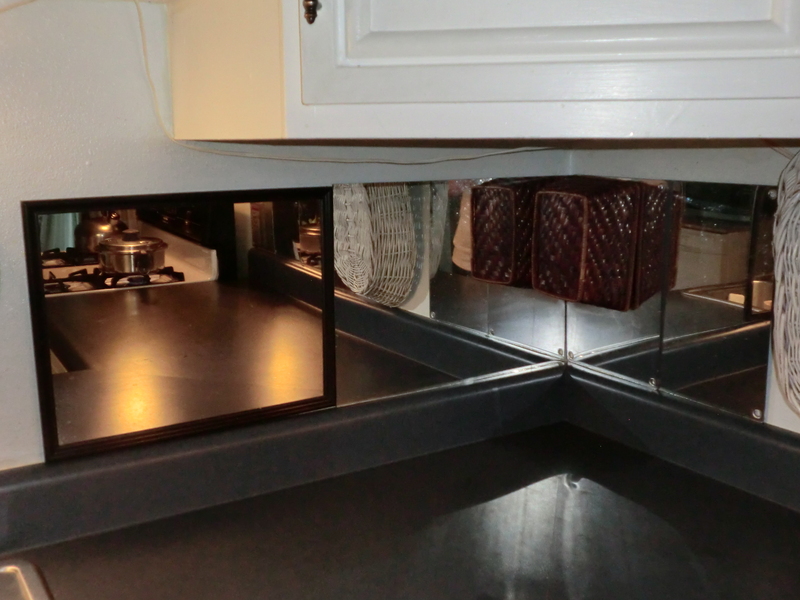 I decided to “make” a mirrored backsplash. I had several Plexiglas mirrors that my dad gave me. I hung those on the wall on nails. It really brightened up the counter area and I wanted to add more. I used an unframed mirror and a framed mirror that was the same height. People don’t notice the difference. Who stops to inspect a back splash?